Welcome to forth and final part of a ongoing Java PDF Podcast series. Previously we have discussed the topic of Job Interviews with other members of the IDR Solutions team, and discuss our experiences whilst providing tips and tricks with which to help you prepare for these Interviews. If you missed out on these previous entries you can find out more below. Alex Interview on Job Interview Tips and Tricks and Marketing Perspective. Java PDF Podcasts continues to look at the subject of Job interviews and offers, tips and tricks. In our fourth and final Interview on Job Interviews we talk to Suda, the Senior Java EE Developer at IDR Solutions, he is a specialist in XFA. Its Suda’s first time on the show so we learn a little about him, get a few insights, learn what he has been working on and also find out about Suda’s Interview experiences, what they were like and what advice he has to offer to others. Click the play button below to listen, Enjoy!. Download the Podcast (6.46 minutes) to listen offline, when your busy or when your on the move. Listen to us on ITUNES. 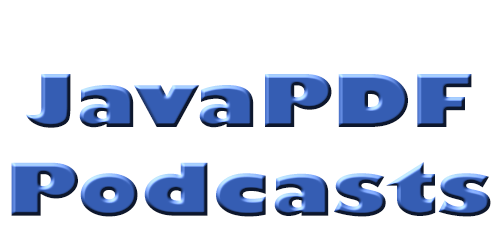 Thanks for listening to the Java PDF Podcast, If you have any questions you’d like to put forward for the next podcast or like to provide any feedback you can contact us via our contact usor by social media (Twitter and Facebook.